NAMM 2014: Drool-inducing British microphone specialist, Sontronics, has announced the launch of a new valve condenser mic, the Aria, designed specifically for vocal recording. The new mic was the brain-child of company founder Trevor Coley and has been beta-tested by the likes of Paul Epworth, PJ Harvey and Abbey Road's engineering staff. Check out the full press release below or head to the Sontronics site for more information. At the 2014 NAMM Show British microphone brand Sontronics have launched a new microphone that has been 18 months in the making. The new Sontronics ARIA is a valve condenser microphone with a fixed cardioid pattern, designed by Sontronics founder Trevor Coley specifically for getting the best from your vocals. The Sontronics ARIA will give you stunning results on every male or female vocal recording, thanks to its silky-smooth characteristics, its accurate response and Sontronics' trademark smooth high-frequency roll-off. Housed inside the chromed grille is a large, 1.07-inch, edge-terminated capsule that captures all the detail and subtleties of any male or female vocal, while the hand-selected European 12AX7/ECC83 tube lends a character that you'd expect to find in a classic vintage valve mic costing many times more. For that extra level of control, the accompanying SPS-2 power supply unit boasts pad (0, -10dB) and filter (linear, 75Hz) switches as well as a tube-ready LED, letting you know when the mic is warmed up and at its best to record. "I've been working on the concept of a vocal-specific valve mic for a long time," explains designer Trevor Coley, "and the ARIA is the culmination of months of research and beta-testing, which I've been lucky enough to do with some incredibly talented musicians and producers. 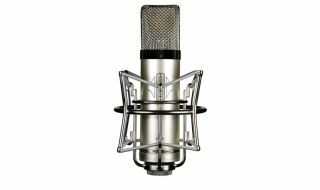 The result is a go-to microphone that really is a must-have for anyone serious about achieving the best, smoothest, warmest possible results from any vocal recording. Sontronics ARIA really will take your breath away!" During the past 12 months of ARIA's development, the mic has been beta-tested by top artists and musicians including Oscar- and Grammy-winning producer/writer Paul Epworth (Adele, Florence & The Machine, Paul McCartney), Mercury award-winning singer/songwriter PJ Harvey, and also several engineers at Abbey Road Studios, all of whom now admit they can't live without their ARIAs! These and other users have all told us that ARIA's sound and quality is easily matched to mics (both modern and vintage) that cost ten times more. The ARIA microphone is supplied in its own velvet-lined wooden box, which comes in an aluminium flightcase together with its elastic spider-style shockmount, a ring mount and the SPS-2 power supply and connecting cable. Like all Sontronics mics, the ARIA is covered by Sontronics' LIFETIME WARRANTY. "ARIA is incredibly smooth with bags of character and it easily competes with any vintage valve microphone!" "ARIA is silky smooth with all the classic characteristics that I'd expect from a vintage valve mic. Yet another well designed and beautiful sounding mic from Sontronics!"